November 23, 2013 By This post may contain affiliate links. 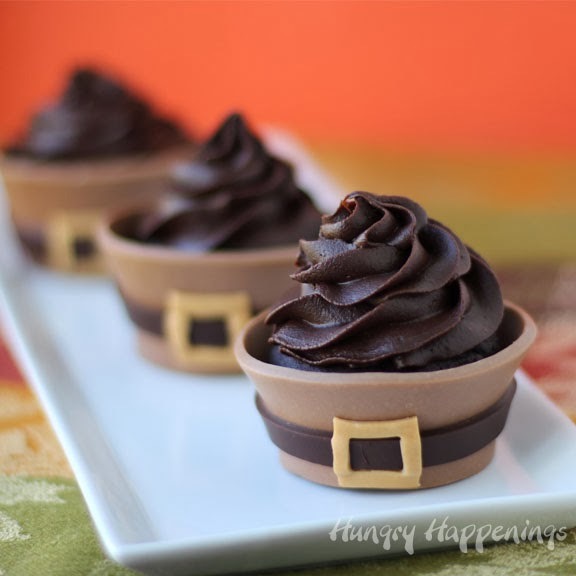 Your dinner guests will fall in love with these luscious chocolate Thanksgiving Cupcakes. Each chocolate cupcake is wrapped in a milk chocolate pilgrim suit cupcake wrapper that looks like a pilgrim suit. They are the perfect ending to your Thanksgiving dinner. Making edible chocolate cupcake wrappers has become a bit of an obsession for me this week. I began with one simple Christmas wrapper idea, then couldn’t stop and ended up making an entire series of festive holiday designs. I figured while I was playing in the kitchen, I’d come up with at least one for Thanksgiving. I don’t recall ever eating a cupcake at Thanksgiving dinner. Have you? 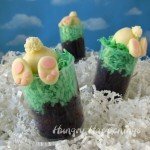 Are they a popular dessert for this holiday? 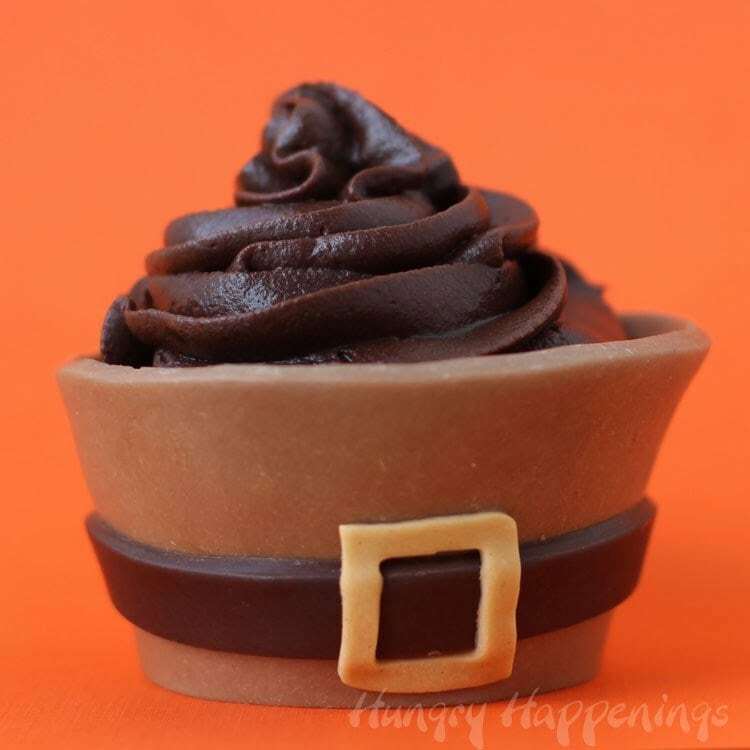 I’m not sure, but, I couldn’t resist making a pilgrim suit cupcake wrapper, anyway. I thought starting out the holiday series with a simple design was a great idea. Each cupcake wrapper is made using modeling chocolate. Have you made modeling chocolate yet? If not, the time is now. 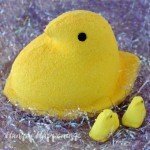 It takes two ingredients, chocolate and corn syrup. 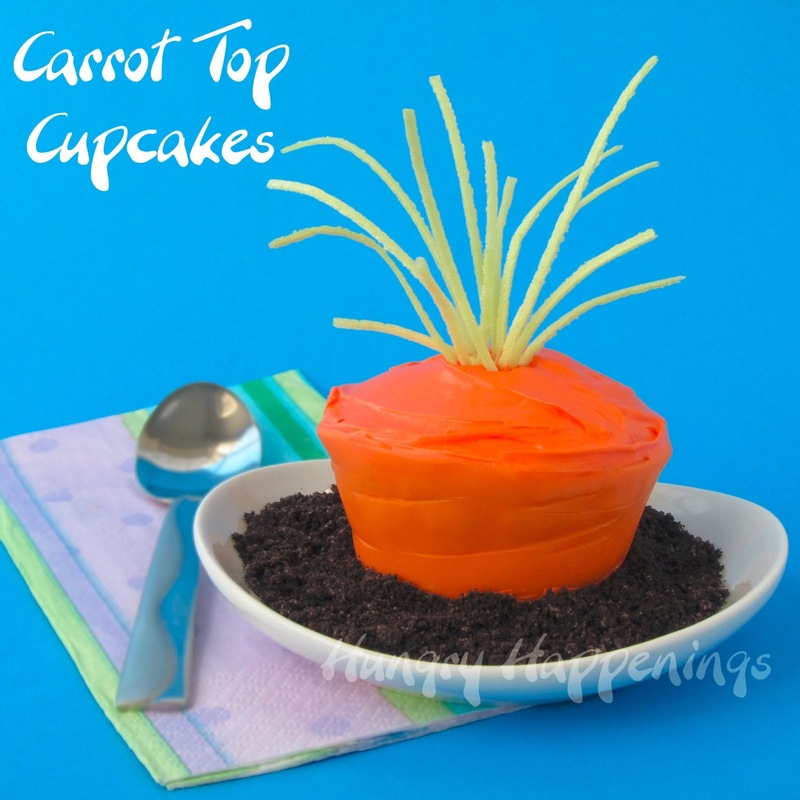 It has a similar texture of fondant, is as easy to work with, but tastes so much better. I can’t imagine eating a cupcake wrapped in fondant, but would gladly gobble up cupcakes wrapped in milk, dark, or white modeling chocolate, and this week, I sure have. If you don’t want to make your own modeling chocolate, you can buy ready made tubs from Choco-Pan. It comes in dark and white. 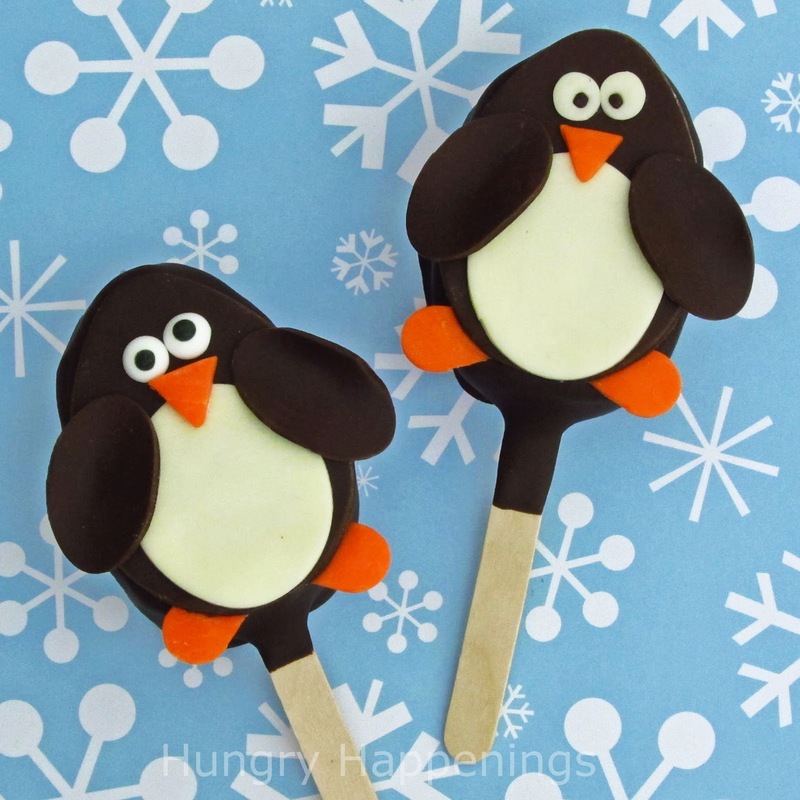 You can color the white using coloring or you can even mix the two to get a nice light brown for these wrappers. *For this project I used milk modeling chocolate for the wrapper, dark modeling chocolate for the band, and peanut butter modeling chocolate (made using Wilton Peanut Butter Candy Melts) for the buckle. If you don’t want to make all three, just use milk chocolate and color some black for the band and add some yellow to make the buckle. You could also add gold luster dust to the buckle. 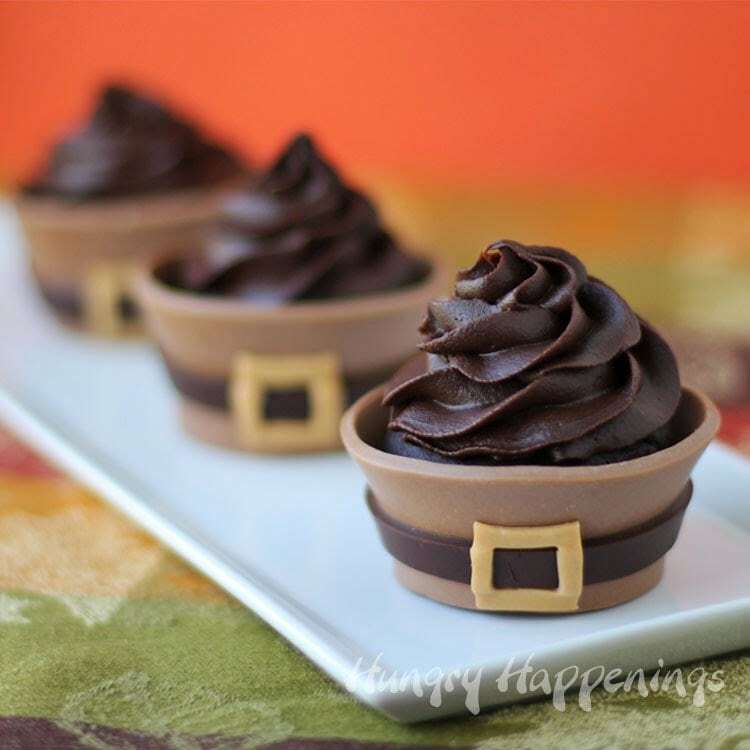 You can see how I used that technique to make my Chocolate Pilgrim Hat Cups, here. It’s hard to tell you how much modeling chocolate you will need. It will depend on the thickness of each wrapper and the size of your cupcakes. I used about 1.5 ounces for each wrapper, plus the decorations. So estimating 2 ounces per wrapper would be a good idea. Go here to get a copy of a cupcake wrapper template. Cut out around the template. 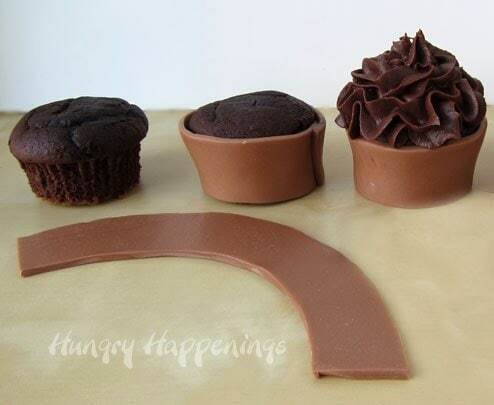 Wrap it around one of your cupcakes, to see if it is the right size. You need the template to overlap at the ends by at least 1/2 inch, so adjust the template as needed. Re-size then cut out a new template. My cupcakes were big, so I had to enlarge the template. 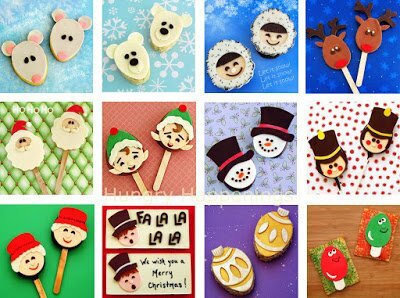 If you are planning to make a lot of cupcakes, you can either print out several templates, or laminate one. 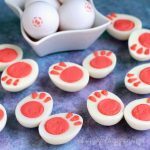 The best way to roll out modeling chocolate is to pat it into a large round disc, place it on a non-stick baking mat, use a fondant rolling pin to roll it out to about 1/8th inch thickness. If you have two mats, you can use one on top of the modeling chocolate too. 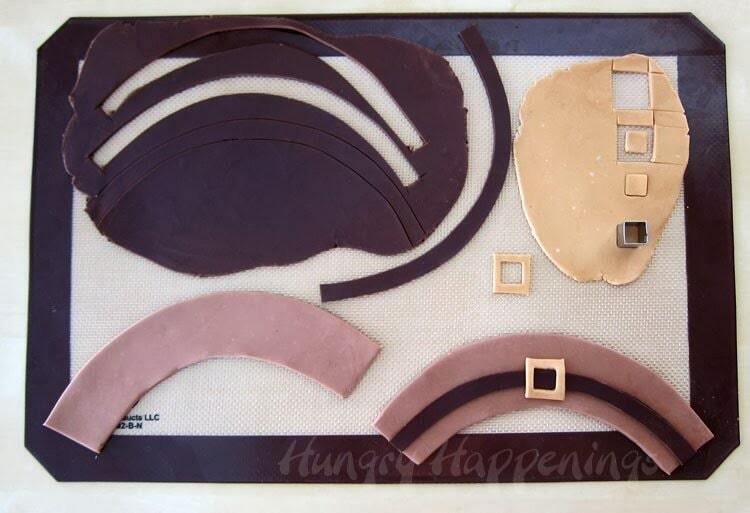 See instructions for rolling out modeling chocolate using a large zip top bag, here.Set the template on the modeling chocolate and use a pastry or pizza wheel to cut out around it. You can use a knife, just be very careful to not cut into your mat. 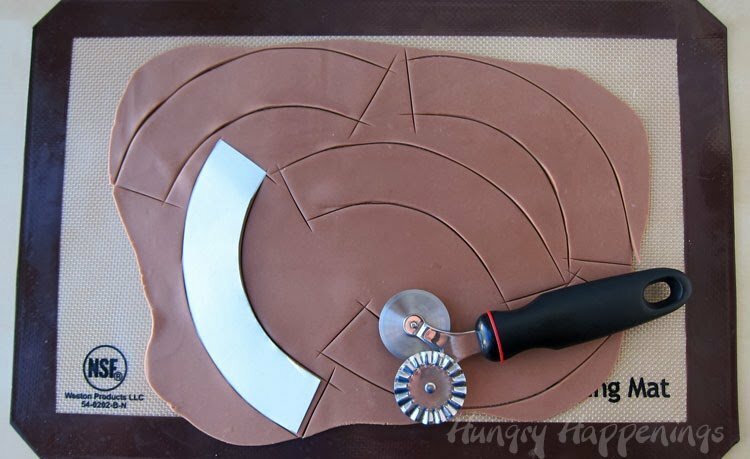 Roll out some black or dark modeling chocolate, use the cupcake wrapper template as a guide to cut out curved strips for the belt. Roll out some peanut butter or light tan or yellow modeling chocolate. Cut out belt buckles. I cut out a small square, using a metal cutter, then cut out around it using a knife. 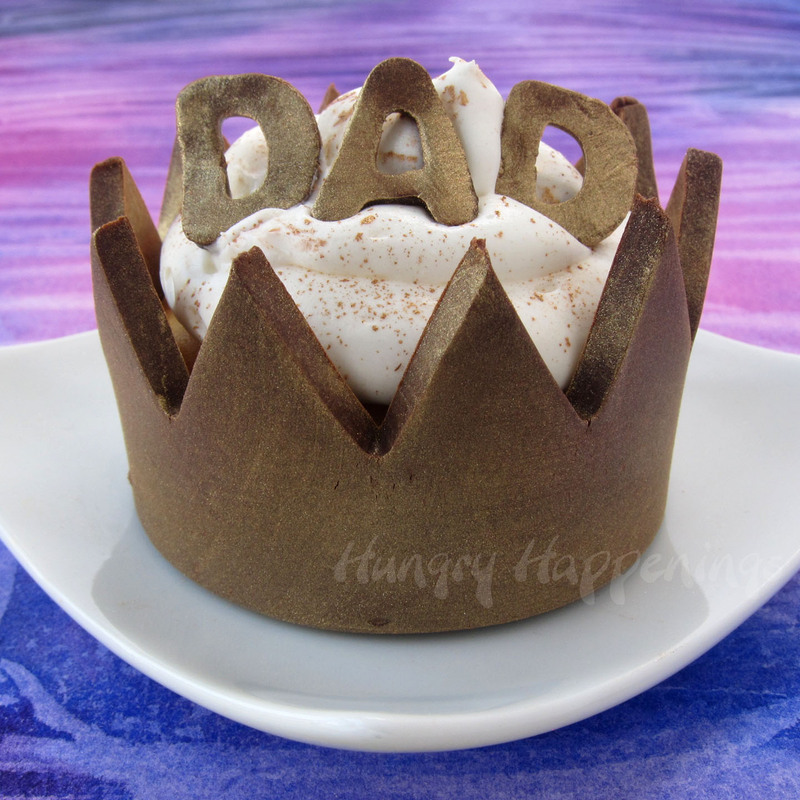 Attach the belt and buckle to the modeling chocolate cupcake wrapper using water. Just brush a very light coating of water on the back side of the decorations then press them down on the chocolate wrapper to adhere. I suggest wrapping your cupcakes the day you will use them. You can make the cupcake wrappers ahead of time and store them in an airtight container to keep the flexible. Modeling chocolate hardens a bit as it dries and will have the consistency of a Tootsie Roll. It will hold it’s shape well, but still be soft enough to easily bite into. 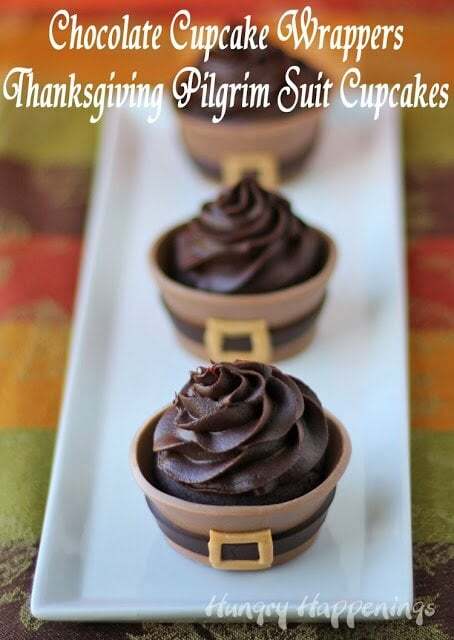 Keeping the cupcake wrappers stored in Tupperware or Rubbermaid containers will help to keep the modeling chocolate soft and flexible.Do NOT refrigerate. 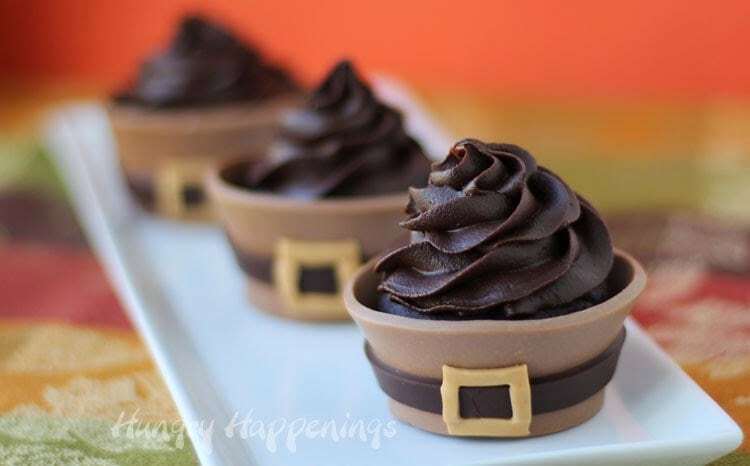 These Thanksgiving Cupcakes are meant to be eaten using a fork, and the entire thing is edible. Previous Post: « Welcome to all the Fox 45 Dayton Viewers. This is beyond adorable Beth! I cannot wait to see all of the other festive designs you come up with, as I am sure they are great!! 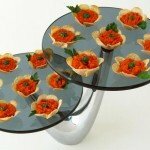 And I think I will now have to try making one of these myself!!! As who could resist not eating and edible wrapper!! Thanks, Morgan. I can't wait to re-create your Rudolph wrapper. I have four Christmas designs done and have a few more ideas. I can't wait to share them! 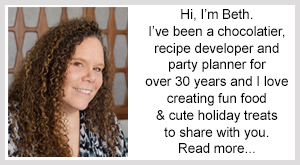 I always think of belting a wrapper for Santa but never for Thanksgiving – this is perfect! These cupcakes should win the "Best Dressed Cupcake" award! 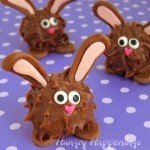 Your photos show off the chocolate yummyness! Okay, over the top adorbs! Thank you, Patricia. I love to me over the top! Okay! This is the cutest thing I've ever seen. Hmmm…now I need to see if I will have time to make it before Thursday! It's always crazy getting ready for Thanksgiving. I hope you find the time to make some! Have a happy Thanksgiving. Yum it looks so delicious. Do you also sell them ? Thank you, Kakaru. Sorry, I don't sell them. 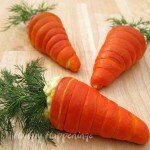 I just make them to share here on my blog. I do sell chocolates, but being my candy kitchen is currently in my home, I can only sell in Ohio. Thank, Megan:) I agree. 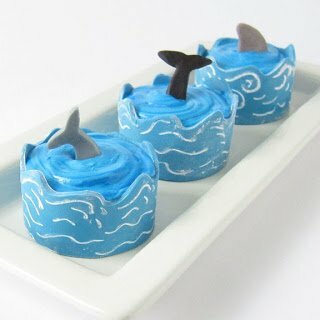 I just gave a bunch of these cupcakes to friends and they raved about them! Oh NO! I can't believe I have to choose between making this and making the pilgrim hats! AHHHH!!!!! Decisions, decisions!!!!! That is tough decision:) I hope whichever you choose, they turn out great! Have a Happy Thanksgiving. I never worked with modeling chocolate, but after seeing this I totally want to now! Such a great idea! Wow! They are so cute!! Your site is so amazing! !